With concern to critical pedagogy, the concept of love is fairly frequently (ab)used, yet under-theorized. In this exploratory study, I ask: How does a critical pedagogy of love—or critical pedagogical love—look, sound, and feel? Regarding feeling, how does a critical pedagogue engage the sensations of pleasure attendant to love? Lastly, how does the pedagogue invite love and pleasure into the pain-filled field of urban teacher education? Using Black feminist theorizing of love as an analytic filter, I investigate a university-based urban teacher educator’s navigation of the nexus of love, pleasure, and critical (specifically, antiracist) pedagogy. 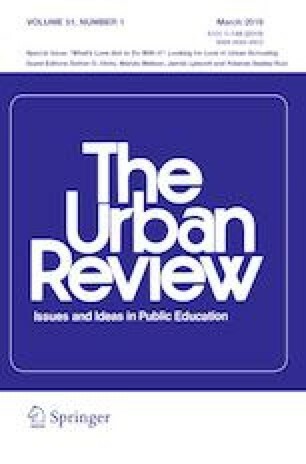 Extrapolating from the resultant narrative portrait, I consider the affordances of a critical pedagogy of love that accesses embodied pleasure, emphasizing how such a pedagogy might present racially marginalized persons—particularly urban teacher educators of Color—with opportunities for reprieve from the suffering that characterizes many of our experiences with/in teacher education. Angelou, M. (n.d.). Touched by an angel. Retrieved from https://cpoem.sunygeneseoenglish.org/2017/01/29/touched-by-an-angel-by-maya-angelou/. Eros (concept). (n.d.) In Wikipedia. Retrieved June 1, 2016, from https://en.wikipedia.org/wiki/ Eros_(concept). Gafni, M., & Hamilton, D. M. (2017). Notes from a lover on the pain of Eros. Blog post. Retrieved from http://www.marcgafni.com/notes-from-a-lover-on-the-pain-of-eros/. Gerassi, J. (2001). The true revolutionary is guided by strong feelings of love. Los Angeles Times.com. Retrieved from http://articles.latimes.com/2001/dec/16/books/bk-johngerassi16. Moseley, A. (n.d.). Philosophy of love. In Internet Encyclopedia of Philosophy. Retrieved June 1, 2016, from http://www.iep.utm.edu/love/. Ngunjiri, F. W. (2007). Painting a counter-narrative of African womanhood: Reflections on how my research transformed me. Journal of Research Practice, 3(1), Article M4. Retrieved from http://jrp.icaap.org/index.php/jrp/article/view/53/76. methods: Secondary data analysis, fieldwork, observation/participant observation, and informal and semi–structured Interviewing. Ethnographically Informed Community and Cultural Assessment Research Systems [working paper]. Retrieved from http://www.cusag.umd.edu/documents/workingpapers/classicalethnomethods.pdf.